We’re delighted to share The Future of Business Report, which we collaborated on with our partners in Vodafone Ireland. The aim of this initiative was for Vodafone Ireland to engage with the SME sector nationwide to gain insights about the future of business, their growth, ways of working, investment, technology, skills and training. The research was commissioned from Amárach of nearly 600 participants, which included SME employers, employees, and a panel of SME industry experts and representatives. Smart working played a huge part in the survey’s findings with 41% of employees stating that they have smart working options available to them and are therefore more likely to recommend their company as somewhere to work. 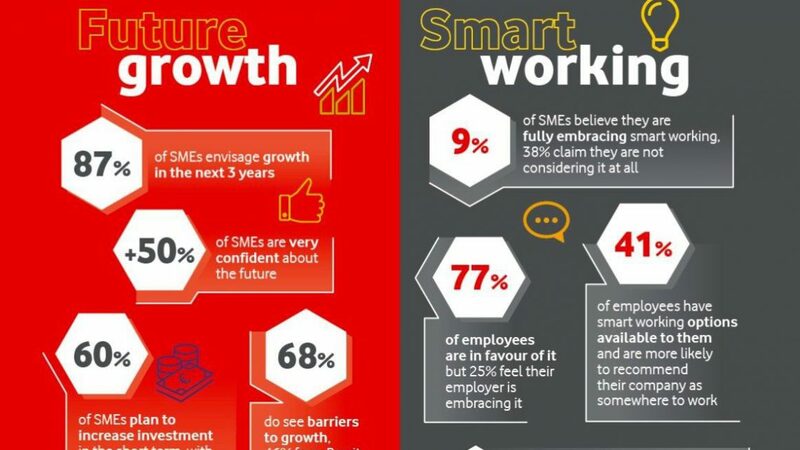 Nearly 90% of SMEs envisage growth in the next three years alongside 33% of employees stating Smart Working as a top priority they expected from their employer. A further 50% of employees stated they would look for smart working in a future role and 34% are likely or very likely to move job for it. Check out the video of our Chief Digital Officer, Louise O’Conor talking about the benefits of Smart Working.